The only kennel in North America to ever have a Grand Champion in all 3 official colours!! The first kennel in Canada to have two Grand Champion Excellents!! Its always a pleasure to attain these titles Breeder/Owner/Handled!! 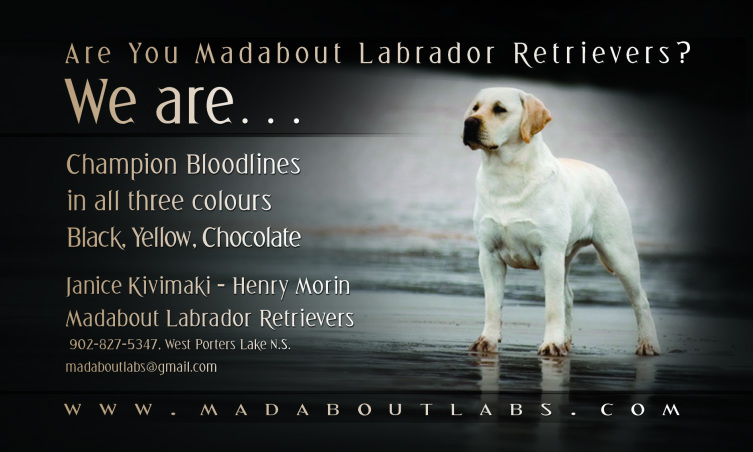 Madabout Registered Labrador Retrievers is located in West Porters Lake, NS. Our dogs have the luxury of running on 38 acres of land or swimming in the lake where a Labrador is truly happy. Although only breeding for the past 12 years we are quite familiar with these wonderful dogs in general and have had the pleasure of owning at least two for the past 25+ years. We have competed seriously in conformation, flyball and agility. As well, we have worked in the field and dabbled briefly in obedience ring. Janice is an active volunteer with St. John’s Ambulance through the Therapy Dog Program as a Provincial Evaluator. Both Henry and Janice are members of the Atlantic Labrador Retriever Club (ALRC), the Labrador Retriever Club of Canada (LRCC) and Labrador Owners Club (LOC). We are past members of the Eastern Flyway Hunt & Retrieving Club and Janice is Past Secretary for the ALRC and Halifax Kennel Clubs. Although when we first started we lacked knowledge and experience we have developed a close knit circle of very experienced breeders and friends that are willing to share their knowledge and expertise. This has made this journey enjoyable and rewarding to say the least. 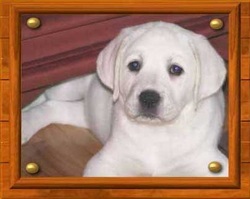 All our dogs are home raised, live in-house and travel with us on a regular basis. Along with our registered Labs we have had several other members of our family that we are proud of; Porter, Chance, Jack, Wishbone and Reese. All rescued dogs, Reese is the only one still living and is 14 this year!! To find out more about our dogs or to arrange a visit please contact us at the number below. We love nothing more then showing off our dogs and talking “dog”. We look forward to seeing you!!! Copyright 2006 Madabout Reg’d Labs.